These are odds and ends. Some don't fit within any specific series. The images represent a variety of printing techniques. The lower right black and white etching was originally created to be sold as a fundraising project for the restoration of the Church of the Advent in Boston, MA. The sculpture of angels depicted is located above where the choir sings. The etchings on either end of the second row were produced as a gift to the Museum of Biblical Art in New York City. They are reworkings of images that Georges Rouault produced for his Miserere etchings. Editions of each were donated to the museum when they were exhibiting This Anguished World of Shadows, a 2006 show comprised of his work. These images also show up in the Altarpiece & Reliquary of St. Georges, except as paintings over text. Other images are a mix of older etchings, monoprints, and lithographs that date back to the 1990s. These were experiments with these methods, a snapshot along the way to current processes with those mediums. 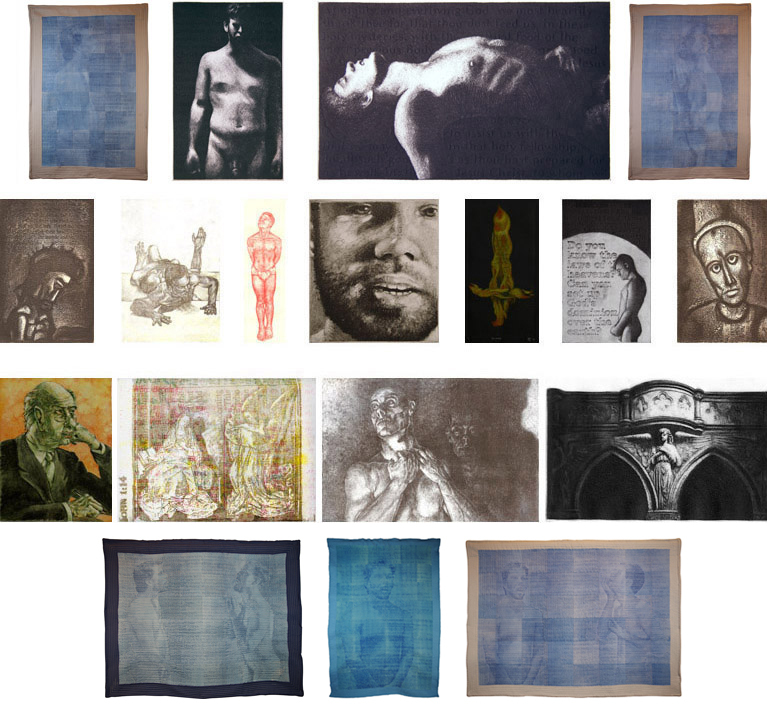 The annunciation lithograph (second from left, bottom row) was originally produced as part of the Christmas card print series, for 2005, but Tyrus liked the image so much that he made a larger version with two additional colors.